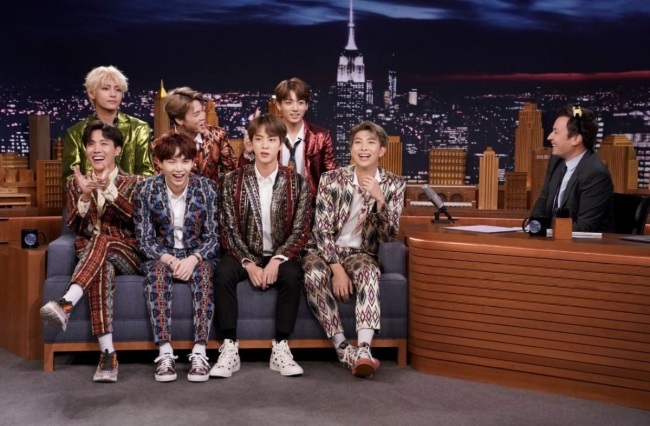 After impressing the world with its heartfelt speech at the UN, BTS made a stop at Jimmy Fallon’s “Tonight Show,” one of the most popular and longest-running nighttime talk shows in the US, to talk about its recent feat and next goal. 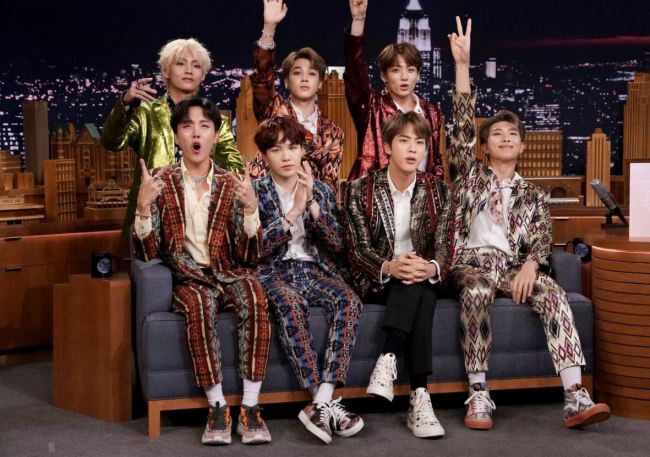 The show’s highly-anticipated episode, aired on Tuesday night in US time, kicked off with BTS members, clad in flamboyant outfits, introducing themselves. RM introduced himself as a translator for the group, while Jin and J-Hope drew out cheers from crowd by calling themselves “worldwide handsome Jin” and “I’m your hope, you’re my hope, I’m J-hope,” respectively. After Suga, V, Jimin and Jungkook briefly greeted fans in English, the members were asked about their recent experience at the UN General Assembly in New York on Monday, where group leader RM gave a nearly seven-minute speech for the launch of the UN’s new youth initiative Generation Unlimited, a program designed to tackle the global education crisis and make education more accessible for young people. “I was so nervous. I was holding that paper and if you see it, I was shaking. It was a big deal,” RM said. The members also talked about the highlights of their stay in New York City. Addressing the act’s UN speech and its upcoming Citi Field concert that was sold out under 10 minutes, Fallon asked about the act’s next accomplishment. 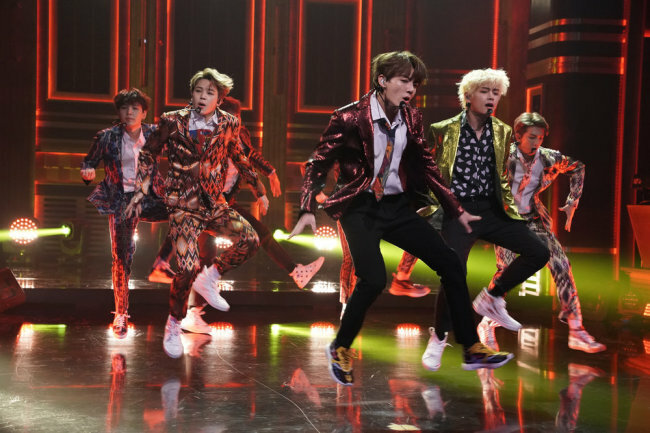 Ahead of the highly-anticipated episode, “Tonight Show” shared a short clip of BTS and Fallon taking on the Fortnite dance challenge by mimicking the dances performed by the animated characters in the mega popular video game. Currently on its “Love Yourself” world tour, BTS is set to appear on “Good Morning America” on Wednesday and perform at the Prudential Center from Sept. 28-29. In November, it will hold a dome tour of Japanese cities, including Tokyo, Osaka, Nagoya and Fukuoka.